Preparation time: 35 minutes. Cooking time: 12–15 minutes. Preheat grill to medium-high heat (350°F–400°F). In a bowl, knead together ground sirloin and Greek seasoning, mixing well. Shape into 4 patties. Grill, with grill lid closed, for 5–6 minutes on each side, or until meat is no longer pink. Warm flat breads if desired (warming will make them easier to fold in half). Cover half of each flat bread with tomato slices, then lettuce. Spoon 1/4 cup yogurt dip over the vegetables on each flat bread. Cut burgers in half and lay 2 halves over the yogurt dip. Sprinkle with Feta. 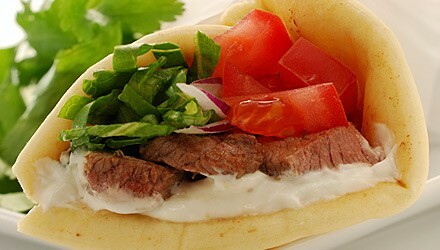 Fold flat breads over burgers and secure each gyro with 2 toothpicks. Serve while warm. Exchanges per serving: 1 1/2 starch, 1 nonstarchy vegetable, 4 very lean meat, 1 fat. Carbohydrate choices: 2.